Traditional MANET routing protocols have a difficult time organizing large mobile networks. Fundamentally this problem occurs because the amount of routing information that needs to be sent exceeds what can be sent by one node in a reasonable amount of time. For example, if a node only needs to send updates about five nodes it can do this is in a single packet, but if it needs to send updates about 500 nodes, it may take 20 or more packets. This long delay contributes to rapid performance degradation as network size increases. Currently this problem is addressed using either a 'hazy sighted' protocol or a hierarchical protocol such as LANMAR. Both these techniques have serious drawbacks. A 'hazy sighted' algorithm sends more updates about a node the closer it is to that other node. This approach only partially mitigates the issue and introduces new problems such as extremely long delays to detect when a node has left the network. Since LANMAR and other similar protocols break the network into groups and then route between the groups, they have unavoidable issues with artificial hotspots, suboptimal routing and the support of highly mobile nodes. The OrderOne Networks Mesh Network Routing Protocol significantly improves on the state of the art. The mechanisms it uses to maintain the path between communicating nodes is virtually unaffected by network size and density. It has none of the drawbacks associated with either 'hazy sighted' or LANMAR type protocols. The hardest mobile networks to organize are those that are very large and very dense. The following illustrates the performance of the OrderOne Networks Mesh Network Routing Protocol in these kind of networks. Below is a screen shot from a mobility simulation with a thousand nodes. The packet delivery ratio for this simulation exceeded 98.5% with 20% of the nodes communicating. 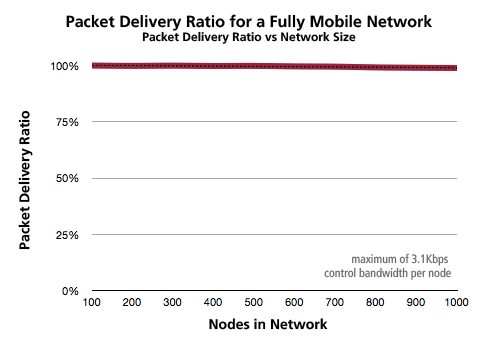 The following chart illustrates how network size does not affect the delivery ratio in a mobile network. Every network size has a constant density with control packets of not more than 200 bytes being sent twice a second. This gives a total maximum per node control bandwidth of 3.1 Kbps. In each network 20% of the nodes are communicating. Layer 2 feedback is used to assign connection costs. The very slight drop off as the network size increases is due to the ever increasing path length. At a thousand nodes path length can exceed 20 hops. If communicating pairs were picked to maintain a fixed path length as network size increased even this slight drop-off would be eliminated. The mobile performance of the OrderOne Networks Mesh Network Routing Protocol is virtually unaffected by network size. This scalability is provided at user fixed control bandwidth levels that may be less than 3.1 Kbps. In real world testing the OrderOne Networks Mesh Network Routing Protocol can provide absolutely seamless handoffs under mobility.